It was a bright sunny day in February (unusually warm for the time of year), as we pulled up in the minibus to Harewood House in Leeds. This would be the site of the National Cross Country. On initial inspection of the grassy course, we noticed the hilly terrain which would provide a extra challenge of the race. After a warm up the Junior Women race was underway with Holly P, and Aiste R representing UOLRAC. Both go of to great starts tackling the initial uphill. Junior Women were racing across 6km of the course. Aiste finished in 38th place with a time of 23:43, followed by Holly in 124th with a time of 30:18, a great run for her first National XC. Next up in the race schedule was the 8km Senior Women’s race. Representing UOLRAC was Frances Arnott, Amy Coulson, and Harriet Smailes. All the women ran excellent races with Frances achieving 191st (35:10), Amy finishing 670th (43:16), and Harriet finishing 845th (47:08). In the 10km Junior Men’s race Aric was representing his home club of Abingdon AC. Aric raced of swiftly, finishing the race with the excellent time of 35:31 (162nd). The Senior Men’s race was 12km. UOLRAC runners included Stephan Headley, Steven Ellis, Andrew, and Kyle. Stephen Headley dominated the race finishing with a time of 43:03. Andrew and Kyle were neck and neck for the whole 2 laps, with times of 47:54 and 47:58 respectively. Steven Ellis finished with a great time of 57:55. Overall of runners ran a great race. The course was dominated by steep unrelenting hills; which we could all feel in our legs the next day. We headed to the English Institute of Sport in Sheffield for the Indoor Athletics Championships as part of BUCS Nationals on 15-17th Feb! 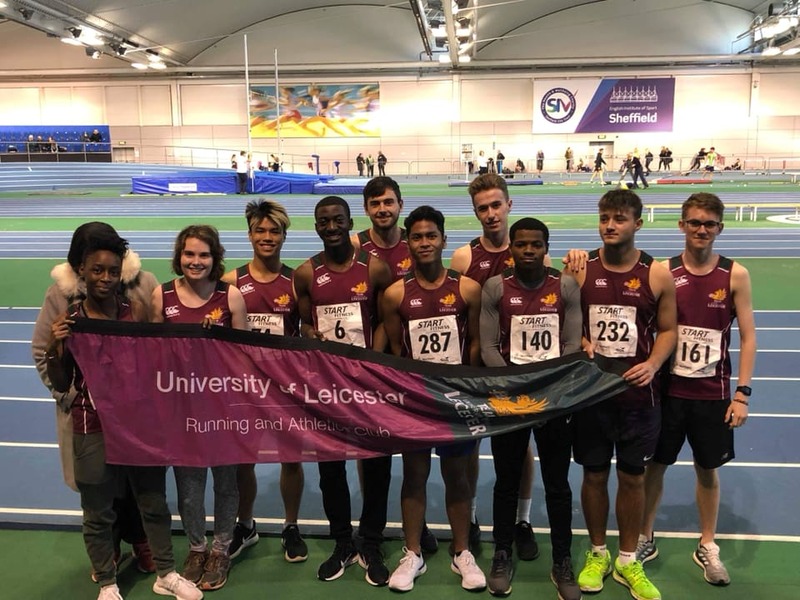 A weekend of high-quality athletics saw us take our biggest ever team, with a massive increase in competitors with 13 individual competitors and men’s and women’s 4x200m relay team! We only had 3 individuals and one relay team last year so it’s brilliant to see the increase in engagement. Ore, Tinashe and Megan ran well in 60m against a highly competitive field. The Friday saw Aric and Finnie bagging PBs in the 800m, with Finnie just narrowly missing out on a semi-final by 0.4 secs. Hannah S ran a really strong time in the women’s 800m whilst on the field Nicole jumped well in the women’s triple jump! Yes, field! For the first time ever, we had a field team at BUCS, a testament to the development of our new field squad this year – Oli, Sophie and Tomasz making up the rest of the competing field squad. An early start on the Saturday saw an entire minibus and a car head up to Sheffield for day 2 of competition, amazing to see so many people competing, promising signs for BUCS outdoors! Aiste, Hannah W and Toby lead the line for day 2, smashing great times in the 1500m. The 400m followed with Megan running a good time coming back into form, and Finnie again narrowly missing out on a semi-final, this time by just 0.09 secs but smashing a PB and Steve Parkes’ club record which had stood since 2013! On the field, Nicole and Oli lined up on the runway of the long jump, both flying through the air with great jumps meanwhile Tomasz looked sharp in the shot, preparing well for his preferred Discuss come the summer. The mascot race followed which we didn’t feature in this year, but with the new Team Leicester Griffin it looks like next year we might be in the running! The day concluded with the ever entertaining and dramatic 4x200m relays! The men were up first; Oli, Luqman, James and Dom running well, Dom nailing the fastest split time. Followed by the girls; Megan, Lizzie, Nicole and Hannah with Megan nailing the fastest split closely followed by Hannah. The girls were unfortunately disqualified, wrongly so we felt but our appeal was unsuccessful, meaning the girls missed out on what would’ve been a club record! The Sunday saw the final day of competition and Ore going in the 200m, but it was to be an unfortunate end to the weekend as Ore pulled up half way round – wishing him a speedy recovery! BUCS Cross Country is the highlight of our XC calendar and once again did not disappoint, with a fantastic day of racing in snowy, yet sunny, EXCeter (more XC puns to follow, dw!). We kicked off with a 6am start which was greeted more favourably by some members than others, namely Abie deciding to stay in bed until 6:05, but before long we were on the road in our eXClusive coach and after many naps and several versions of James Blunt’s back catalogue we arrived at the course! Shout out has to go to Will Bray for championing in the annual karaoke champs on the trip, with a less than conventional version of Britney Spear’s toxic! The tent died (enough said). The ladies’ race was up first, they were to set out on a 2-lap course of 6km taking in a number of hills and a water feature, in the form of the shores of a lake, nicely thumbed into the course for good measure. With a downhill start and adrenaline pumping the race hurtled off to a quick start but our athletes held their own, battling hard against a very strong field from unis from Aberdeen to Plymouth! Many of the runners opted to avoid the eXCitement of water’s edge, however our very own veteran, Abie (fresh from her extra half an hour in bed), was no stranger and was actually the 3rd athlete through the water – unfortunately this isn’t where the medals were awarded. Frances was our first girl home, placing in the top 100 – a fantastic achievement not achieved by any Leicester runner of recent years. Aiste and Hannah W came in shortly afterwards in 143rd and 251st to complete the team placings for the UOLRAC girls. There were some eXCellent runs from the girls that followed too, with Hannah S, Abie, Rachel and Anna coming in next weirdly all 30 places apart from each other finishing 407, 437, 467 and 497 respectively – spooky! Amy, Tabby, Harin and Sudha all put in great performances too completing what I believe to be UOLRAC’s biggest women’s BUCS XC team! A strong team performance all round allowed the girls to be the 24th fastest institution on the day, a massive improvement on 32nd place last year and a huge achievement for the club. Next up was the men’s A race (typically with so many men they run in two races, with the first counting for BUCS points and the 2nd an all out battle for pride!). Another tough course faced the boys, tackling 3 laps to make a 10km course featuring 3 opportunities to enter the lake! A special shout out to Kyle for braving the water feature but also stacking to go face first into the water – the disappointment when we realised no one had filmed it! Stephen lead the UOLRAC boys home after an eXCeptional run placed him just outside the top 100 finishing 104th (2 places higher than last year), James G and Toby had a great battle behind placing 194th and 198th respectively, with Kyle coming in 225th to make up the final men’s team placing. Aric and Andrew put in brilliant runs to battle hard against each other and push the other boys on, finishing 239th and 246th to round of a great men’s A team. Strong performances from the boys placed them 40th in the team rankings, 4 places higher than last year – more improvement a pleasure to see! Last but by no means least was the Men’s B race, a 8km course taking in the much sought after water feature, that up until this point had seen little action from the highly competitive women’s and men’s A races – that was all about to change! With all of our UOLRAC boys never ones to disappoint, they eXCelled in the water, entertaining the crowd with face plants, belly flops and press ups with the UOLRAC flag wave proudly in the background! Despite this, back out on the course there were also some excellent efforts in the running, adorned with hair dye and face paint, James F lead the boys home, closely followed by Callum and Alex. Drew, Will, Peter and Steve showed great form to come in next with splendid runs from Ben, Sean and Adam wrapping up a fine UOLRAC team. All of our runners that made up our scoring teams each finished higher than last year’s (and the year before’s) counterparts with men jumping up the table from 44th to 40th and women climbing from 32nd to 24th – a credit to the athletes and a testament to great coaching from Martin this year! A fantastic weekend had by all and I’m truly proud of a fantastic team performance. Thanks eXCeter, roll on BUCSXC2020! North Mids XC Heanor - Shipley Park! In comparison to the wild, wet and windy conditions at Kettering, this Saturday at Heanor we were blessed with quite reasonable weather (just as well because we’ve still not got any decent pegs for the tent). This course is probably the hilliest of the league, not helped by being rather squelchy. The women's team turned out a very creditable 11 (although the boys beat them with 13 Athletes) Special mentions to newcomer Adam and congratulations to Stephen Headley for a creditable 12th place despite a fast start leading the field at the first bend! A couple of noticeable duels. The Durham girls (Amy and Abie). The ex-captain chasing the current captain (Alex and James F). A strong finish up the hill allowed James to place top 100, but they’d both better watch out for Callum who was within spitting distance. It will be good to see the competition develop between Andrew, Toby and Aric at the next race as they were only 40 secs apart, with James Gibbons close on their heels, followed up with a spectacular mud dive! It was good to see Peter and Will gradually improving and ex-ex-captain Steve Ellis back for his first race of the year. The ladies team was led home by Frances closely followed by a poorly Aiste (plucky run to keep going). Laura (nearly dumped in the mud by the ever loving Alex) completed the counters for the team. Applause to the rest of the ladies team Rachel, Holly, Harriet (back from injury), Celia, Anna and Tabby. On Sunday we headed to our first ever BUCS Duathlon with @uol_cycling The Athletes had an early start as we loaded up the mini bus with our bikes and equipment before heading 3 hours south to Castle Coombe Race Course. As the minibus arrived we got the bikes set up (a new phenomenon for us runners! ), warmed up and ready for the 2 mile run, 10 mile cycle, 2 mile run. James Finnie, Andrew Holland, and cycling team member Matthew Clegg were first to race. All 3 got off to a fantastic start to the race before quick transitions to the bike. Matt did the cycling team proud by not being able to count to 5 and did an extra bike lap! However he still managed to post a great time of 57:01.2 . James Finnie and Andrew Holland posted competitive times of 54:47.0 & 51:31.7 respectively. Toby Austin and Amy Coulson went next in race 2 with Toby bagging the quickest run time of the day; running the first 2 miles in 10:52.1, and a total time of 52:42.0. Amy Coulson put in a stellar performance after a nervous start on a bike unfamiliar to her. She quickly took to the bike, getting a total time of 1:04:42.4. After strong effort from all, we left with finishing medals, and a strong sense of pride before making the long journey back north to the motherland (via maccies in true UOLRAC style, obvs). North Mids XC Kettering - WET! It's one o'clock on Saturday 10th Nov, a sunny and pleasant day at Wicksteed Park Kettering. Runners of all shapes and sizes scampering around. Tents are being erected - just as well because there's a dark cloud approaching. There's the UOLRAC flag flapping joyfully but the tent and gazebo are about to take off! Maroon and green tops hold on, Guy ropes hastily being pegged (bent pegs). Then it starts to rain, water dripping down necks. Despite this smiling faces abound. The women's team have a turnout of 12. This is perhaps a record for UOLRAC at the North Mids X country league however the men's team equal it also with a dozen not that there's any competition. Always good to welcome this year's newcomers,Toby, James, Callum, Drew, Maximillien, Will and Hannah, Amy, Rachel, Celia and Tabby some of whom have seen sense and moved from rugby. On Saturday 13th October, last year’s and this year’s Club Captains of the Running and Athletics Club travelled to the Ricoh Arena in Coventry for England Athletics’ National Volunteer Awards and Hall of Fame. We had recently been crowned East Midlands Club of the Year at the regional awards and were shortlisted alongside two other clubs for the national club of the year award. This was a great honour for the club and recognition for all the hard work of the previous year. We were recognised for our work in promoting inclusivity within the club by making all of our sessions open and accessible to all abilities and promoting LGBT equality through our annual Pride Colour Run! On the evening we unfortunately didn’t win the national award, but it was still a great honour to be recognised in the top 3 athletics clubs in the country and represent Leicester Uni on the national stage! We were inspired by all the nominees present that were up for awards and are planning on introducing some of these ideas into our club this year, for example introducing England Athletics Mental Health Ambassadors within the club to champion mental health and promote the wellbeing of our members. Through this scheme we plan to host several #RunAndTalk jogs throughout the year to provide a platform for students and staff of the university to talk about mental health and encourage people to get into running as a way of improving mental health and wellbeing – watch this space for dates! The evening also featured new inductees to the England Athletics Hall of Fame which included Jessica Ennis-Hill, Katharine Merry and many more, amazing to be at a ceremony alongside so many greats of the sport. Overall, an excellent and inspiring evening alongside some of the greats of the athletics world championing the University of Leicester and our Running and Athletics Club. If you are interested in any form of running or athletics it’s not too late to come along, more details on our website www.uolrac.com or just drop us a message on Facebook and come along to a session, all of our sessions our suitable for all abilities! First North Mids XC - Derby! 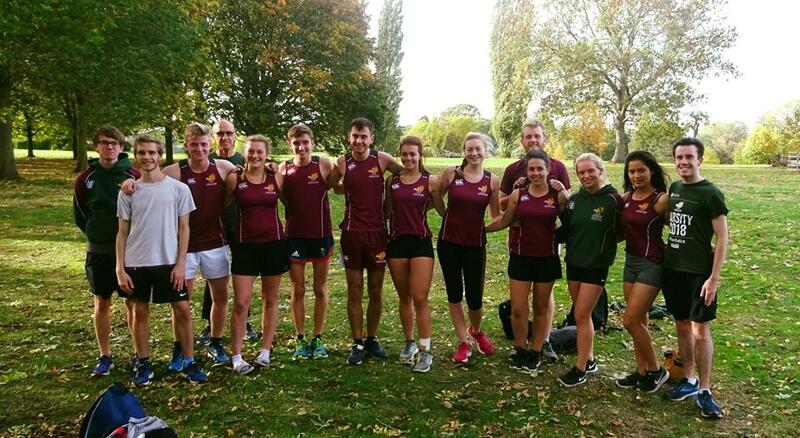 The Cross-Country season in our local North Midlands league began with an unusually sunny race at Markeaton Park, Derby, a stark change from the typical mud and rain! We headed to the course in the minibus with a great early turn out of 15 people, including 3 new comers to the Cross-Country team. The race around the grassy scenic park was mostly flat apart from two large climbs per lap. After a team warmup, the Women’s team headed to the start line to begin their 6.5km race. After a tiring 2 laps everybody put in a strong finish. Hannah Willis who finished 27th despite an ankle injury the week before, and Amy Coulson in her first race for UOLRAC finishing in 90th were some of the highlights of the race in a strong field of around 150 women. The Men’s team had 3 laps, totalling 10km. Everyone put in full effort with the pre-season training paying off. Stephen Headley after a great race finished in 16th position, and the rest of the team showing an excellent performance against a competitive field of over 200 athletes. 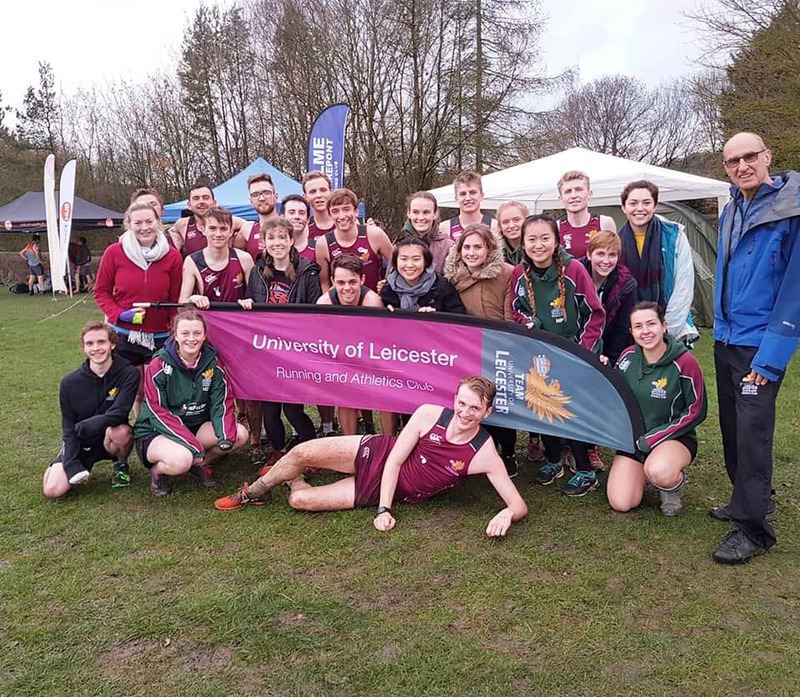 Max Soviche and Peter Parkinson put in stellar performances in their first cross country league race for the University of Leicester. The first race was an outstanding success for both teams boding well for the rest of the season. A great turnout, seconded by a great performance from everybody!